Home Antique of the Week	Spring Time is Planting Time! Spring Time is Planting Time! I love that Spring is finally here up in the Northeast! I am diving headfirst into the season by beginning to plant my flowers, herbs and veggies! 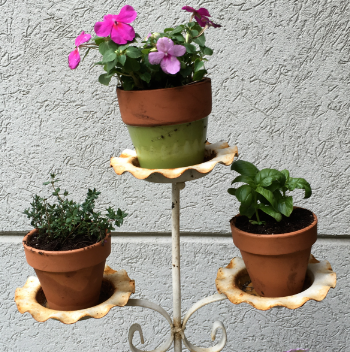 I found this cool old plant-holder at a local store awhile back and envisioned a mini-herb-garden waiting to come to life! I also mixed in a few small pops of color where I could. I planted some Thyme, Basil, Cilantro and Chives in this particular mini-garden. I gave this to one of my sons as a gift. I know he will love it because he also likes to cook and plant! A Crown for a Crown….